Wowowow. 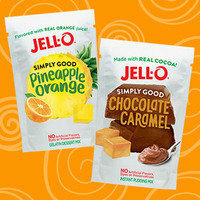 Jell-O's brand-new dessert lineup contains no artificial flavors, dyes, or preservatives! These mixes are made with natural ingredients like fruit juice, vanilla bean, and cocoa. The gelatin-mix flavors include Strawberry and Pineapple Orange, among others; the pudding mix comes in Banana, Chocolate Caramel, and more! The calorie and fat counts are similar to the regular lines', so if stats are your number-one concern, you might want to stick with Jell-O's lower-calorie sugar-free lineups. FYI: The stats for the just-add-water gelatin mix numbers won't change once prepared, but you do need to factor in milk for the pudding. Prepared with fat-free milk, a serving of the pudding will have about 145 calories (SmartPoints® value 7*). It's soup season! These newbies have a lot going for them: They're vegan friendly, non GMO, and contain no artificial colors, flavors, or preservatives. And the varieties ROCK! Hearty Lentil with Garden Vegetables (yum), Hearty Tomato with Spinach and Roasted Garlic (double yum), and Hearty Corn and Chipotle Chowder (holy Toledo!). Each box has about two servings, so double the stats if you spoon your way through the entire thing. (Hello, easy lunch.) Track 'em down here. OMG. 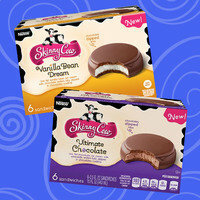 The vanilla version of these new treats from Skinny Cow tastes like the lovechild of a Klondike bar and a Ring Ding or Ding Dong! If you're looking to treat yourself to something beyond light ice cream, but want to keep your indulgence under 200 calories, look no further! Try all three flavors: Vanilla Bean Dream, Ultimate Chocolate, and Creamy Caramel. Click to find. At least two-thirds of PepsiCo's drinks will have 100 calories or less per 12-oz. serving by 2025. We know 2025 is far away, but it's better than having no plan at all, right?! This is all part of the company's new sustainability initiative. And sodas aren't the only beverages that are likely getting their calorie counts downsized. PepsiCo also makes SoBe fruit drinks, Dole juices, Naked Juice, Lipton Tea, and Gatorade. Let the calorie slashing begin! These new flavors of Matt’s Munchies are totally worth ordering online! Have you tried the best chewy fruit snack around, Matt's Munchies? Well, the organic fruit-leather treats now come in a couple of new varieties, and they are game-changingly good: Grape (with a hint of banana) and Tropical Punch (sprinkled with hemp seeds)! 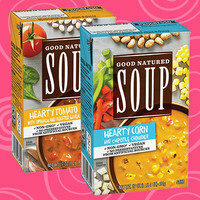 An entire package has just 90 - 100 calories (SmartPoints® value 4*). We love that the single packages qualify as Add-on Items on Amazon. (Click the previous links to order.) You can also order packs of 6 or 12 from the brand's website! Well, that's all we've got. 'Til next time… Chew the right thing! Today, October 24th, is Food Day. This may sound generic, but it's actually a national event focused on changing our diets and food policies for the better. Check it out! Jell-O with natural ingredients, outrageously good ice cream novelties, and a step-taking breakthrough? Click "Send to a Friend" now!